Beginning July 13 and continuing for the next three weeks, we will release one or two items on our list per day, beginning with No. 25 and working our way up to story No. 1. Today, we announce No. 13. You know that saying, “The more things change, the more they stay the same?” When it comes to the fall ball sports, it seems some of the girls teams in Utah Valley are sticking more with the last part of that saying. In the four seasons since the fall of 2011, of the 12 state champions in 4A girls soccer, 4A volleyball and 5A volleyball, nine have come from Utah Valley. Precisely, it’s the same three champions three times each and that’s a lot of winning. Since we struggled to choose between the three, all of which are 2014 state champions, our No. 13 story of the year is a combined recognition of Timpanogos girls soccer, Timpview volleyball and Pleasant Grove volleyball. The 4A girls soccer title chase in 2014 was pretty clear-cut from the outset. Region 7 rivals Timpanogos and Skyline split their regular-season matchups and were on a collision course for a state championship game repeat all year long. When it came, Timpanogos (16-2) made it two championships in a row, and three in four years, survived in a penalty-kick shootout (7-6) after a scoreless draw through regulation and two overtimes. The Timberwolves, fittingly, won on the strength of a save by goalkeeper Carly Nelson that combined with a PK make by Aspyn Farrer to finally seal the title. Nelson and Skyline keeper Hillary Weixler took turns protection the frame all night long, and the shootout was a battle to see which team could best solve the other’s net minder. In the end, Nelson was one save better and Timpanogos was celebrating again. It was the second postseason win in a shootout for the Timberwolves, who also survived in the quarterfinal win over Woods Cross. The 2014 title was the team’s first under the direction of rookie head coach Megan Fereday, who replaced three-time state champion coach Natalyn Lewis on the Timpanogos bench. The season featured outstanding scoring from midfielder and leading scorer Jordyn Chung-Hoon along with senior strikers Devri Hartle and Natalie Reynolds. In front of Nelson, Sahalie Donaldson, Imelda Williams and Olivia Burnett provided the backbone of an outstanding defense, and sophomore Kami Warner provided strong play moving between the back line and the midfield. 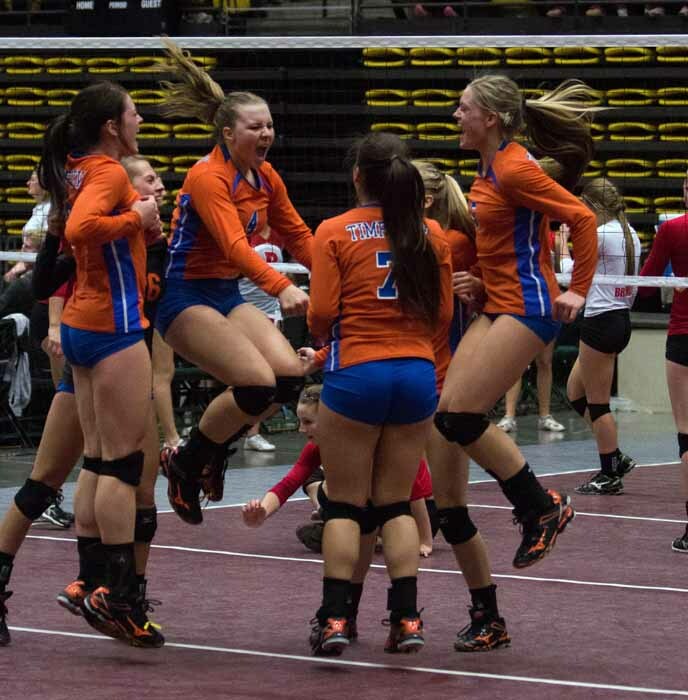 The 2014 season cemented Timpview as the dominant force in Class 4A volleyball. It was the second consecutive state title for the Thunderbirds, who are a near-miss short of four straight, as they lost a tough five-set state finale in 2012 as well after winning state in 2011. 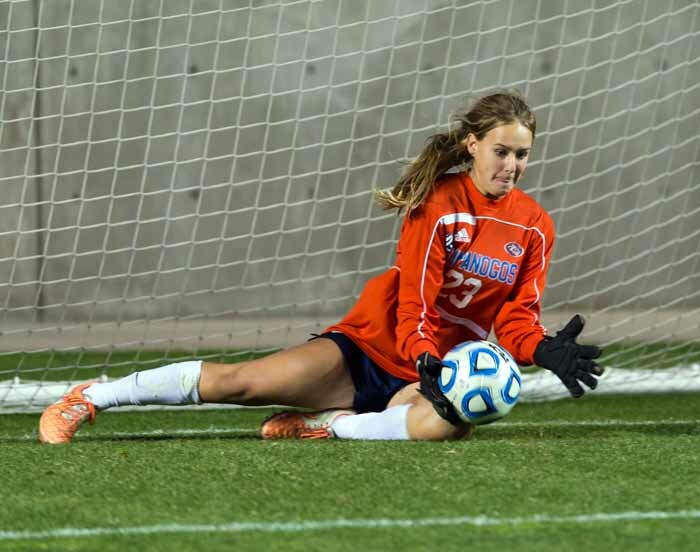 That makes it three championships in four seasons for Kristen Bailey and Timpview. The 2011 team was somewhat of a surprise champion, but by 2013, the dynasty was in full swing. That 2013 team was the best team in the state, featuring senior superstars Jessie Jorgensen (now playing at the University of Utah) and Lauryn Dela Cruz, and junior twins Lyndie and Lacy Haddock (playing at BYU) as a dominating quartet. It was hard to imagine the same kind of results in 2014 after the graduation of Jorgensen and Dela Cruz, but the Haddock sisters led a new-look group that had a less dominating look while delivering the same kind of results. Seniors Annie Hofheins, Maliyah Tela, Anessa Atuaia and Kirsten Dahl all played major roles on this title-winning squad. Once again, the Thunderbirds ran the table at state, not just winning four consecutive matches, but doing so without losing a set. 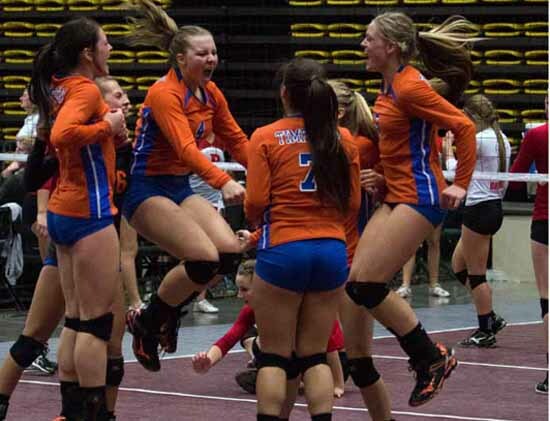 Timpview has become the volleyball program against which everyone in 4A is measured. Pleasant Grove did the other Utah Valley repeat champions one better, as the 2014 state 5A volleyball title was its third in a row. The Vikings may get their greatest benefits from local Utah Valley competition. The 2014 team lost seven games, but three of them were to teams from California at an out-of-state tournament. Two of the other four losses came to Region 4 foe Lehi, who Pleasant Grove beat twice in league play, but to whom the Vikings lost twice in preseason tournament action. The final two defeats were a non-region loss early in the season to Timpview and a solitary region loss to Lone Peak. That’s four in-state losses, all to teams from the neighborhood, so to speak. Seniors Alissa Alger, Alexus Sharp and Brooklynn Bodily all played huge roles for Pleasant Grove, but this was a team that also has a strong contingent of younger stars, led by 5A state MVP, junior Bailey Nixon, the team’s most explosive hitter and server. Junior setter Jeniel Biggs and junior Brooklyn Dahl, along with sophomores Brielle Fowler and Sara Hamson were all part of this extremely talented group. The Vikings will be among the favorites again in 2015, but the drive for four straight took a blow when the uber-talented Nixon went down with a severe knee injury during summer play. That leaves a new challenge for head coach Allyce Jones and her team to conquer. 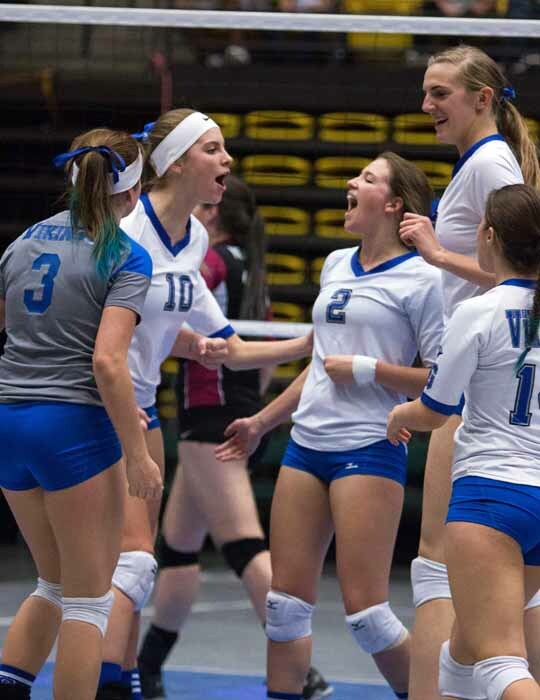 The 2014 team swept its way through the first three rounds of tournament play, and despite dropping a set to, not surprisingly Lehi, in the state championship matchup, that win was also a dominating performance. For now, there are a lot of fall season power teams among the Utah Valley girls, and this combination was too much to ignore in our Preps Utah Top 25 countdown.